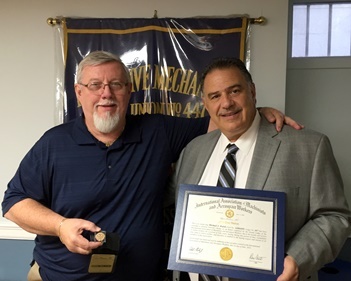 IAM Retiree Mike Walsh, left, receives his 50 year pin and certificate from Eastern Territory General Vice President Jimmy Conigliaro, Sr.
Mike Walsh will tell you he’s a very fortunate man. “I always told everyone that I was blessed,” says Walsh. Walsh recently celebrated 50 years as IAM member, a journey that began in 1966 as a mechanic for a truck and trailer dealership in Philadelphia. He would go on to work as a maintenance welder at Crown, Cork and Seal, then at the fleet maintenance garage at Acme Markets. He held an IAM union card at every stop. “I went to work my first day in an IAM union job, and had a good union job my whole life,” said Walsh. He went on to serve as an IAM Business Representative, then Directing Business Representative of the former IAM Local 724 (now Local 447). He eventually became District 15 Assistant Directing Business Representative, where he served until 2013. His last boss was Jimmy Conigliaro, Sr., now General Vice President of the IAM’s Eastern Territory. Conigliaro was on hand to present Walsh with his 50-year pin and certificate.